Mini-,magnetic hooks, compact and lightweight, inlaid with a super-strong force of the latest generation of 'Magnetic King' called super permanent magnet, which can be strongly attracted by iron, steel, nickel and other ferromagnetic material. -Whether magnetic hooks can hold 0lb,few pound or even 22lb,your steel plate is decisive! Thin steel means saturation of flux in the magnetic circuit. Excess magnetic flux is wasted in the air and can't be utilized. Thick painting will give rise to a great leakage of flux,only a small portion of flux from magnetic hooks can be utilized to provide attractive force.The thicker the painting, the worse the magnetic force! 3)Magnetic hooks can't attract non-ferromagnetic plate like:aluminum,cu,wood,plastic. -How to achieve the advertising attractive force 22lbs? 1) 0.08 inches or thicker A3 steel plate. 2)The steel attracted by magnetic hook should be placed horizontally, no tilt. 3) No painting or rust covered on the steel. 4) Straight upside down hanging of magnetic hooks. -Straight upside down or sideways hanging? Straight upside down hanging of magnetic hooks is recommended, though hanging method of sideways is used in the most common place. Capacity of sideways hanging of magnetic hook is determined by the friction of the attracted item, it is much smaller than Straight upside down hanging of magnetic hooks. See picture#3 and picture#4. Please be reasonable when sticking the magnetic hooks to a thin steel with thick and smooth painting at sideways, like Refrigerator,Filing cabinet....etc,because most flux is wasted in air! 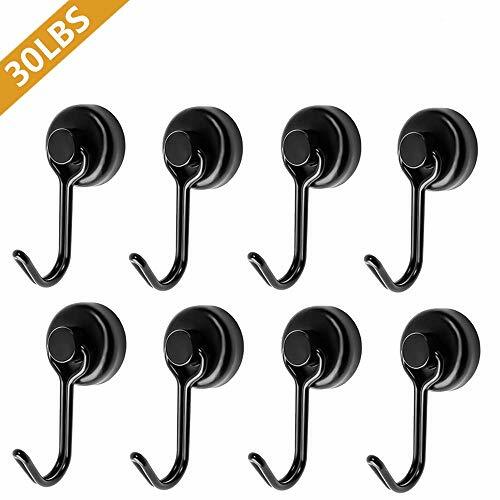 10pcs of 22LB Magnetic hooks. If you have any questions about the magnetic hooks, our customer service staff will reply to you within 24 hours. 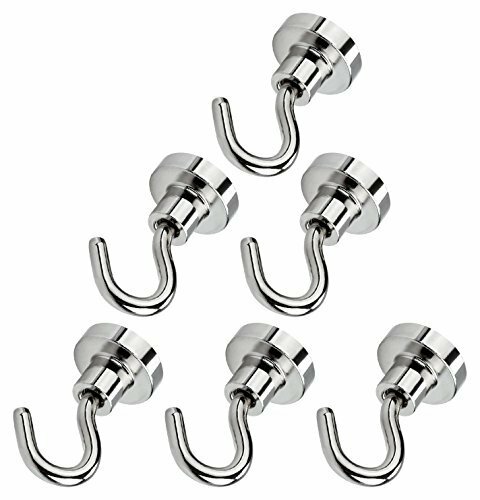 Amazing strong, sturdy and reliable magnetic hooks with a very small size ! Made of high grade and exquisite quality Neodymium magnet and steel. 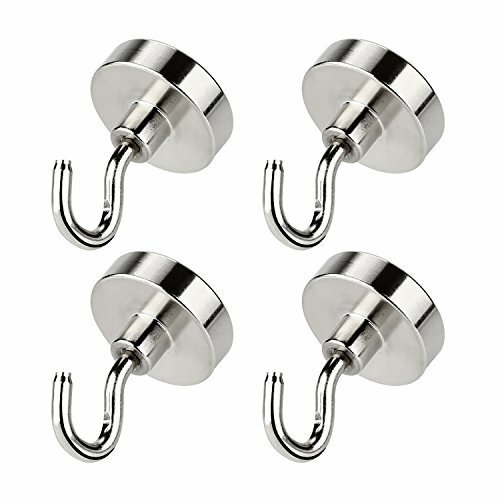 Three layers nickel coated on magnetic hooks greatly reinforces corrosion resistance ! Maintenance free, no rust ! 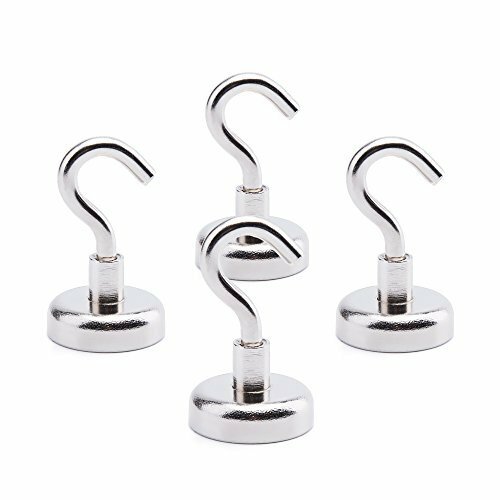 Smooth bottom of magnetic hooks prevent scratches, beautiful hooks perfectly decorate home. 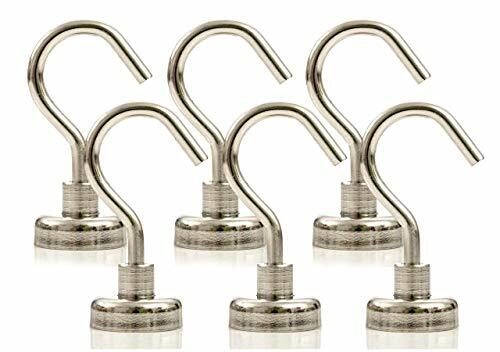 Magnetic hook is an ideal choice for hanging small things in bathroom,kitchen,living room, indoor,outdoor and workshop wherever there are iron or steel. Permanent magnetic hooks, magnetism lasts forever ! GREATMAG as a high-tech company is a professional manufacturer of sintered NdFeB magnets and magnetic assemblies. Multi - Purpose hanging, storage and organization solution Magnetic hooks can be used anywhere in the home, school, warehouse, garage, office or as a travel accessory wherever there is a magnetic or metal surface. No tools required, quick and easy to assemble. Hundreds of uses perfect for kitchen utensils, tools, filing cabinets, mechanics, wiring, washing lines, steel doors, hanging lights, decorations, cruises, the refrigerator and so much more! 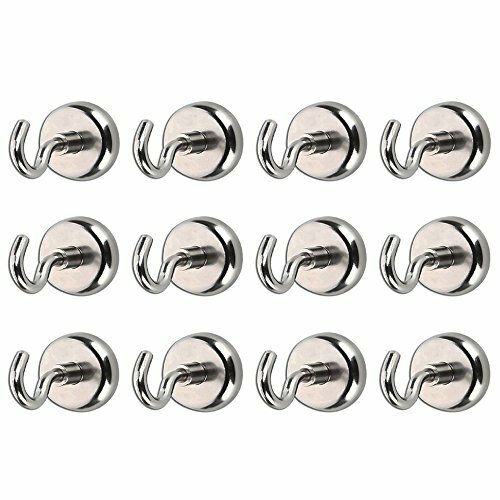 GREATMAG Super Powerful Heavy Duty Magnet Hooks Magnetic hooks, compact and lightweight, inlaid with a super powerful NdFeB magnet, which can be strongly attracted by iron, steel and other magnetic material. To achieve up to 80 LBS pull strength the magnet has to be attached to a horizontal surface - imagine the hook attached to a ceiling with a basket hanging from it. Vertical application the pull force is usually 1/3 weaker. Surface smoothness and steel thickness can also have an impact. More Items Please search GREATMAG in Amazon if you need some of other high-qualified magnets. HIGH QUALITY: Produced by ISO 9001 quality system, made of super powerful Neodymium magnet and carbon steel. INDUSTRIAL GRADE: Maximum 80 lbs in direct pull power, amazing powerful and sturdy. MULTI PURPOSE: GREATMAG magnetic hooks can be used indoor or outdoor, the school, workshop, garage, bbq, office, home, locker, warehouse, refrigerator or even on a cruise wherever there is a magnetic or metal surface. Mini-magnetic hooks, compact and lightweight, inlaid with a super-strong force of the latest generation of 'Magnetic King' called super permanent magnet, which can be strongly attracted by iron, steel, nickel and other ferromagnetic material. Please be reasonable when sticking the magnetic hooks to a thin steel with thick and smooth painting at sideways, like Refrigerator,Filing cabinet...etc,because most flux is wasted in air!! -Whether magnetic hooks can hold 0lb, heavier item or even 40lb, your steel plate is decisive! Thick painting will give rise to a great leakage of flux,only a small portion of flux from magnetic hooks can be utilized to provide the attractive force.The thicker the painting, the worse the magnetic force! -How to achieve the advertised attractive force 40lbs? 1) 0.12 inches or thicker A3 steel plate. 2) The steel attracted by magnetic hook should be placed horizontally, no tilt. Capacity of sideways hanging of magnetic hook is determined by the friction of the attracted item, it is much smaller than Straight upside down hanging of magnetic hooks. See picture#5 and picture#6. 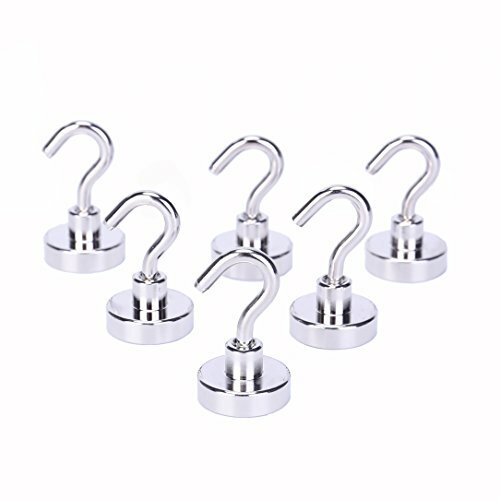 6pcs of 7.5LB Magnetic hooks. Three layers nickel coating greatly reinforces corrosion resistance ! Maintenance free, no rust ! Smooth bottom prevent scratches, beautiful hooks perfectly decorate home. Ideal choice for hanging things in bathroom,kitchen,living room, indoor,outdoor and workshop wherever there are iron or steel. 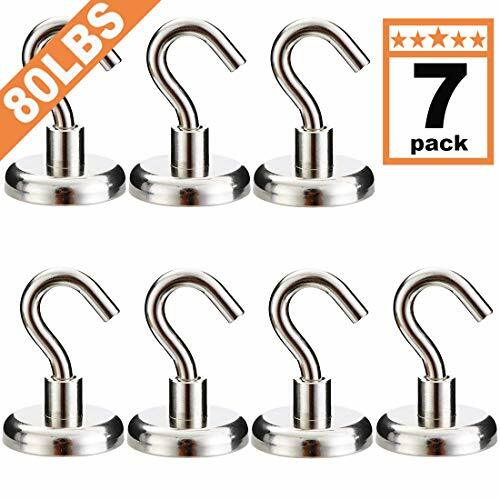 6X7.5lb magnetic hooks(measured on 0.39 inch iron plate) are very easy to install and use! 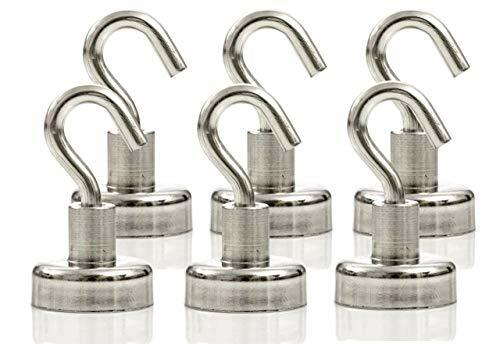 POWERFUL, SMALL AND EXTREMELY LIGHTWEIGHT 25LB NEODYMIUM MAGNETIC HOOKS! - Are you sick of clutter? - Are you fed up of not having enough storage space? - Fed up and ready to take action? IF THE ANSWER IS YES, WE HAVE THE PRODUCT THAT YOU NEED! No glue, no nails, instant storage solution!!! - Hundreds of uses perfect for kitchen utensils, shed tools, filing cabinets, child safety, mechanics, wiring, washing lines, removing nails/screws, steel doors, hanging lights, decorations, cruises, the refrigerator and so much more! - Made from high grade (N38) Neodymium. Neodymium is a rare earth metal and is the strongest magnetic material in the world! Small, lightweight and extremely strong. OUR BONUS JUST FOR YOU! Important to achieve up to 25lbs pull strength the magnet needs to be attached to a horizontal surface - imagine the hook attached to a ceiling with a basket hanging from it. Vertical application the pull force is usually 1/3 weaker. Surface smoothness and steel thickness can also have an impact. DON'T WASTE YOUR TIME LOOKING AT OTHER PRODUCTS, WE HAVE THE BEST SOLUTION! BUY NOW BEFORE OUR SPECIAL PRICING EXPIRES!!! MULTI PURPOSE - Can be used indoors/outdoors, the kitchen, bathroom, bedroom, garage, lockers, office, your refrigerator or even on a cruise! The perfect storage solution! LIFETIME GUARANTEE - Your purchase is protected, return at any time if you are unhappy! What are you waiting for? It's time to declutter! 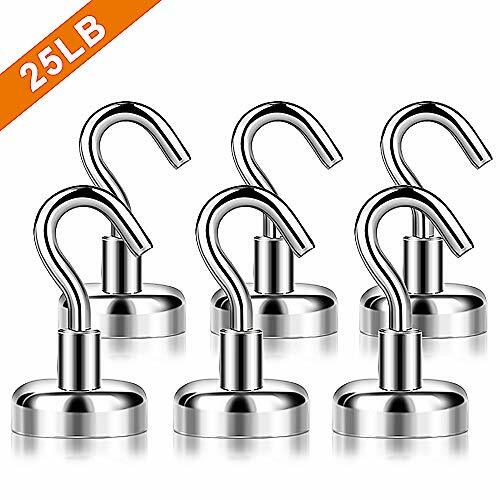 POWERFUL WITH SUPERSIZED HOOKS 44LB NEODYMIUM MAGNETIC HOOKS! - Fed up of not having enough storage space? - Ready to take action? IF THE ANSWER IS YES, WE HAVE THE PERFECT PRODUCT FOR YOU! No need for glue or nails, instant storage solution!!! - Hundreds of uses perfect for Kitchen utensils, heavy work tools, sheds, filing cabinets, child safety, mechanics, wiring, washing lines, steel doors, cruises, the refrigerator, hanging up decorations and more! - Made from high grade Neodymium which is the strongest rare earth metal in the world! Important to achieve up to 44lbs pull strength the magnet needs to be attached to a horizontal surface - imagine the hook attached to a ceiling with a basket hanging from it. Vertical application the pull force is usually 1/3 weaker. Surface smoothness and steel thickness can also have an impact. 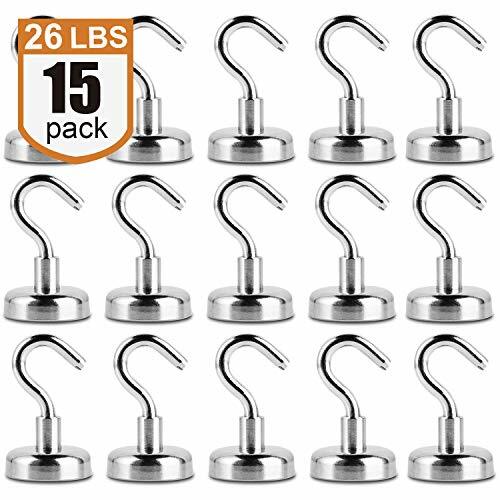 BIGGER PACK & HOOKs - 6 x 44lbs Magnetic Hooks with 6 x stickers. Our hook is larger than other suppliers (2cm opening) which means you can hold larger objects; smaller hooks are restrictive! Magnetic assemblies are best for small sized magnetic products with maximum pull strength (ideally when in direct contact with ferromagnetic e.g. mild steel surfaces). The actual pull force achieved is dependent on the surface that is being clamped onto (material type, thickness, flatness, friction levels, etc. ), its quality (e.g. rust free), its size (thickness plus total surface area), etc. There are many applications for magnetic assemblies, mainly in applications where a strong clamping force is required. Applications include Point of Sale, window dressing, door / cupboard and gate clamps, false ceiling clamps, signs and banners, torque limited seals, jigs and fixtures, lighting holders, marketing and exhibition displays, retrieval magnets, industrial fixings etc. Small size & Large suction: Magnetic hook has the characteristics of small size, large suction, when vertical adsorption on the material surface, can maximize the suction. Also, the contact surface's thickness, material, roughness and friction force will also influence the suction in some degree. Widely Used: Strong magnetic hook widely used, the structure is simple. Don't need to damage the metope to fixed suspension items, adsorption and move is very convenient, can use for a long time. 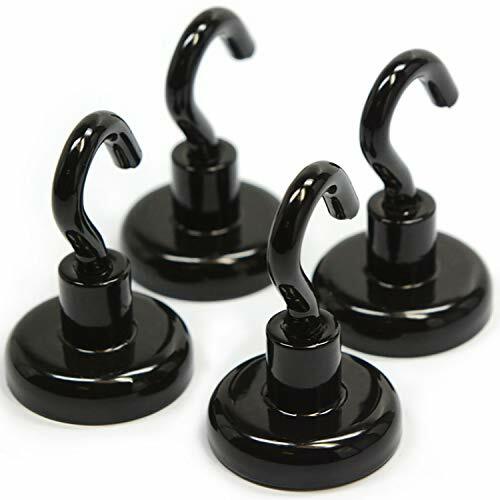 Color:Black Magnet Hooks Neodymium 40 Pound Pull These super strong magnetic hooks will attach to any magnetic surface and can also be easily and quickly removed without leaving any markings. Each hook magnet has a super strong top quality neodymium magnet which is recessed inside a powder coated steel cup.versatile product that can be placed almost anywhere and hold up almost anything with ease. These magnet hooks are more than powerful enough to hold your stuff. When attached to a smooth clean metal surface these magnets can even be used in permanent applications with plenty of holding power to spare. If being attached to delicate surfaces that are easily scratched then a thin sheet of cardboard plastic or rubber can be placed in-between the magnet and the surface. Used For: Fall Decor apron hook magnets Magnetic key hooks Magnetic refrigerator hooks Magnetic wall hooks Magnetic locker hooks Magnetic hooks for steel doors Calendar Carport Tool Hanger Toys Wreaths Sheds Dividers Bathroom Whiteboard As Cruise Ship Accessories Hang Gadgets & Supplies on the grill your "go" bag where you can find it Magnet Hooks For Hanging Almost Anything Getting rid of the clutter Organize it and storage Magnetic hooks for hanging tools knives cups cords... Teachers use these small magnetic hooks for hanging decorations from classroom lights As Wall locker accessories A Magnetic hook refrigerator Hanger for tea towels When you use these Magnetic hooks for cruise cabins they stick to the mostly metal walls and you can get so much out of the way in that cramped cabin. Temporary anchoring point in your car trunk or for banners posters string lights Aprons or other objects. Easy put up easy no scratch take down. Our Three Layer (Nickel-Copper-Nickel) Increases You Magnets' Physical & Corrosion Protection For Many Years Of Trouble Free Use And Gives It That Chrome Colored Touch Of Class. Brand: CMS MAGNETICS | Manufacturer: CMS Magnetics, Inc. If the answer is yes, our Strong Heavy Duty Magnetic Hooks are the perfect storage and organization solution for you. 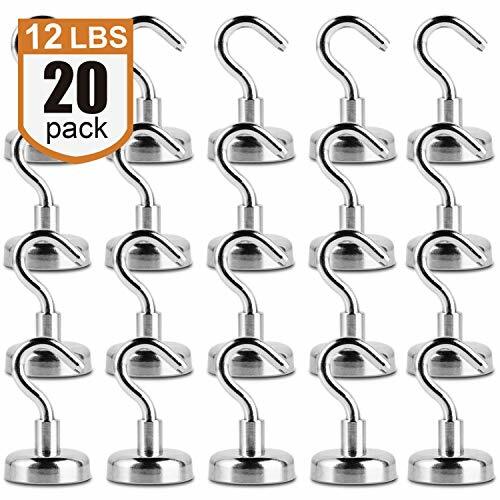 Simply place a hook on any metal surface to easily organize your kitchen, garage, home, work, office, travel, or anywhere else you need quick and easy storage. Cables, Wires, Washing Lines and More! If for any reason you are unsatisfied, just let us know and you will receive a courteous and prompt refund or replacement within 24 hours. It's that simple. Do yourself a favor and take action to finally organize your life! We can't guarantee this promo will last, so scroll up and click "Add to Cart" now! THE PERFECT ORGANIZING SOLUTION - Get organized and stay organized with our heavy duty magnetic hooks. Effective for any room or space, indoors or outdoors. Perfect for your home, kitchen, workplace, office, garage, shed, gym lockers, key holder, cruise ship accessories, grill, range hood or even the side of your refrigerator. UNMATCHED STRENGTH AND DURABILITY - With 40 lbs pull force, our hook magnets are super strong. Made from the world's strongest magnetic element, our set of neodymium hook magnets can hold just about anything and everything. SUPER VALUE PACK - Each set includes 5 Heavy Duty Magnetic Hooks and 5 Bonus 3M Adhesive Non-Scratch Stickers. Quick and easy to use with no tools, no drilling, no glue, nails, or screws. And no scratches on your stainless steel refrigerator. INDUSTRIAL GRADE - Designed and made from the highest quality materials, our rare earth magnets are small, lightweight, and surprisingly strong for hanging. With excellent resistance to demagnification, our magnets are perfect for both temporary or permanent applications. 100% MONEY-BACK GUARANTEE - If you are not absolutely thrilled with your magnetic hooks, return them for a full refund or replacement. No questions asked. We stand behind the quality of our products and are confident you will LOVE your hook magnet set. Hit Add To Cart now. STEADY WITHOUT DRILLING - Steady for magnetic surface. 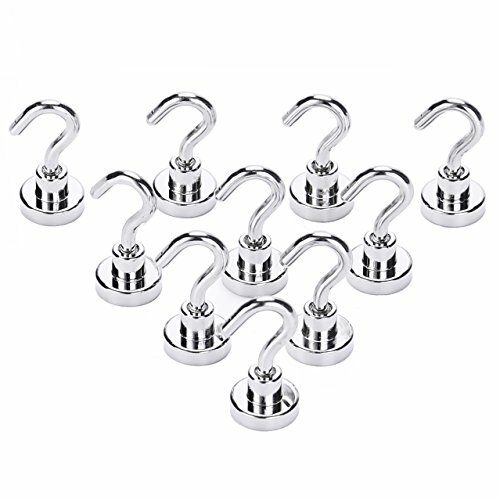 High grade neodymium magnet hooks for organization, mounting, decorating and storage. ALL PURPOSE - Eye bolt is removable and may be replaced with other threeded parts. 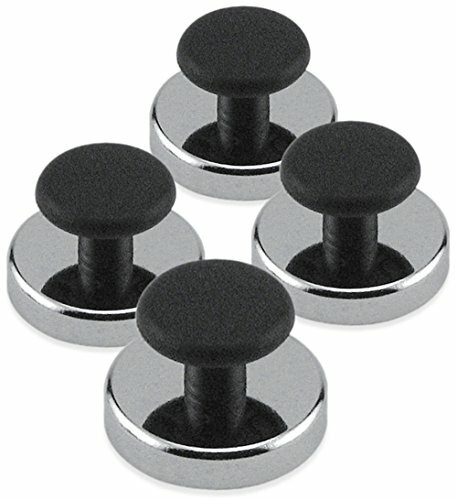 These magnets are ideal for the manufacturer, adult inventor, researcher, DIYer, problem solver, etc. ORDER NOW WITH 100% RISK FREE - Netany is proud to provide High quality products and back that up with LIFETIME GUARANTEE. If you're not satisfied with your magnets, neither are we. That's why we offer a no questions asked money back guarantee and/or easy product replacement. Our industry-leading technology brings us over 100 million happy users. For past 10 years, we are devoted to improve problems in life and work with our premium quality magnets. 100% customer satisfaction is our greatest effort. Our mini magnetic hooks are for science, innovation, engineering and industry used. Height: 15mm (without hook); 37.8mm (with hook). Window dressing, door, cupboard and gate clamps, false ceiling clamps, signs and banners, torque limited seals, jigs and fixtures, lighting holders, marketing and exhibition displays, retrieval magnets, industrial fixings. Used for kitchen utensils, shed tools, filing cabinets, child safety, mechanics, wiring, washing lines, removing nails/screws, steel doors, hanging lights, decorations, cruises, the refrigerator and so much more! To reach maximum 25lbs pulled strength, the magnet must be attached to a horizontal flat surface. Imagine the hook attaching to a ceiling with a basket hanging from it, when applied strength vertically the pulled force is usually 1/3 weaker. Paint and rust on metal surfaces will impact adsorption of metal thickness. We believe in our products. We provide friendly customer service and easy-to-reach support. PREMIUM QUALITY Our Magnetic Hooks are produced by international standard. They are made of carbon steel and rare earth neodymium magnet. It is the premium magnetic material in the world. INDUSTRIAL GRADE It has 25lb holding power while direct pull, powerfully strong and sturdy. Hooks are finished with 3 layer of nickel coatings, provide corrosion resistance! No maintenance and rust resistance. MULTI PURPOSE Suitable both indoor and outdoor. Used them in your home, garage, school, workshop, office, locker, warehouse, on refrigerator and even on cruise. Perfect for storage solution. EASY TO ASSEMBLE No tools required, quick and easy to assemble. No drilling. No holes. No mess. The hook bolt is removable, and can be replaced with other threaded parts. Beyond your imagination. LIFETIME GUARANTEE We offer lifetime money back guarantee with every purchase! If you are not completely satisfied with your magnets, we will refund your purchase with no exception! Click the Add to Cart Button now! 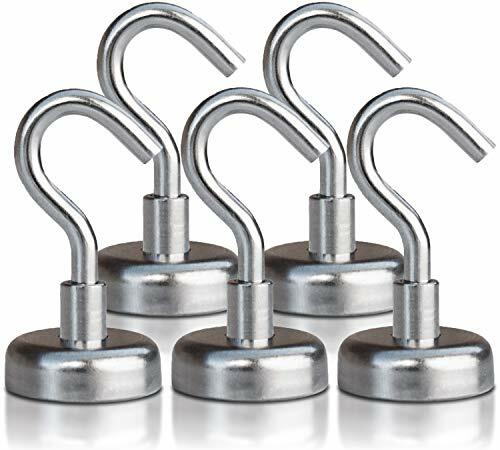 40LB RARE EARTH NEODYMIUM MAGNETIC HOOKS ARE SUPER STRONG AND LOOK GREAT! ARE YOU TIRED OF CLUTTER? With our magnetic hooks you can quickly and easily organize your: Kitchen/ Garage/ Home/ Work/ Office Space NO TOOLS REQUIRED. QUICK AND EASY TO ASSEMBLE. - Put them on any magnetic surface. - No drill. No holes. No mess. GREAT FOR PERMANENT OR TEMPORARY USE. - Never lose your keys again with magnetic hooks. - Great for hanging seasonal decorations. - Take them on the road with you for extra hanging and storage solutions. AS AN EXTRA BONUS! - Receive our 3M non scratch adhesive sticker pads. - 4 included in every pack. - Simply attach 3M sticker to the back of the magnetic hook, to prevent surfaces scratches or damage to your finer stainless steel appliances, splash backs or other magnetic surfaces. SO MANY HANDY USES. 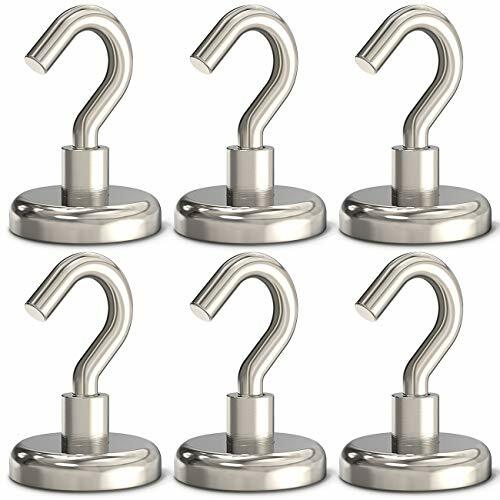 - Neodymium Magnetic Hooks work great on refrigerators, metal filing cabinets, mobile homes, tool boxes, workplace lockers, stainless steel kitchen backdrops, RV's, magnetic whiteboards, steel shelving or any other magnetic surface. - Handy to help organize tools, sporting equipment, kitchen utensils, keys, gardening equipment, cables and wires, calendars and much, much more. *DIRECT PULL STRENGTH* -A plant hanging from a hook magnet attached to a steel or metal ceiling would be an example of "direct pull". Attached to a vertical surface, "sheer force" is roughly 1/3 less than direct pull force. The thickness and content of the steel and the friction of the finish also have an effect. WE GUARANTEE! Our Magnetic Hooks are made from high quality materials and are built to last. But if, for any reason you are not 100% satisfied, simply return the set for a replacement or full refund of the purchase price. WHAT ARE YOU WAITING FOR? BUY NOW AND GET YOUR LIFE ORGANIZED! WHAT'S INCLUDED - 4x 40lb Strong Neodymium magnetic hooks and 4x 3M scratch free adhesive pads. NDUSTRIAL GRADE - Small but super strong magnetic hooks, made of premium materials. With a brushed nickel finish that looks great in any environment. MULTI PURPOSE - Use them in your home, kitchen, workplace, office, garage, shed, gym lockers or even on the side of your refrigerator to hold your spice rack. Use for organizing, decorating and storage. ADDED BONUS - With the included 3M scratch free adhesive pads, simply attach to the magnet base and you will never have any fear of scratching or damaging your finer surfaces such as stainless steel appliances. WE GUARANTEE! - If for any reason you are not 100% satisfied, simply return the set for a replacement or full refund of the purchase price. WHAT ARE YOU WAITING FOR? BUY NOW AND GET YOUR LIFE ORGANIZED! INDUSTRIAL GRADE: 26LB Capacity is based on horizontal application. Have you have felt so upset for the weak plastic adhesive hooks? Or do you want a compact, tools-free, scratch-free and strong load-bearing capacity hook? If so, Ant Mag Magnetic Hook is the perfect solution. With extremely strong rare earth magnet and stainless steel carabiner hooks, it can support up to incredible 60lbs on vertical hanging and 20lbs on horizontal hanging. Never worry about having no place to store heavy stuffs like hammers. Simply attaching magnetic hooks to any metal surface to quickly organize your kitchen, bathroom, bedroom, garage, workplace or anywhere else you need quick and easy storage. Enjoy a spacious and clean room. And you can hang your lockers, towels, paint brushes, brooms, brackets, hats, coats, aprons, bags and practically anything else you can think of. Never worry about losing your keys again. 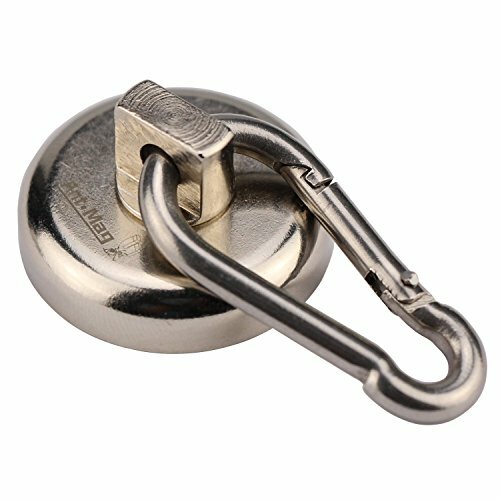 Our Magnetic Hook is constructed with one neodymium magnet, metal cover, wafer, swivel part and stainless steel carabiner hook. Carabiner Dimension: L1.6" x W0.78"
Base Dimension: D1.26" x H0.7"
- Keep it away from children. Children are not allowed to play with it due to extremely strong magnet. - Keep it away from electronic devices like mobile phones or computers or magnetically sensitive objects such as credit cards or pacemakers. Refund guarantee if our pack of 2 magnetic hooks do not live up to your expectations, no question asked. Reinforced Magnet- Our Carabiner Magnet are made of the strongest neodymium magnet, which produces an intensive force of attraction that holds up to amazing 60lbs on vertical hanging and 20lbs on horizontal hanging. Easy Assembly - Installation is simple just by attaching it to metal surface. No drilling holes, no sticky residue, no tools required and no scratch on your furniture. The spring-loaded carabiner works great for quick on-off. Wide Application- Great for both indoor and outdoor use, such as your home, kitchen, office, garage, warehouse, refrigerator, BBQ or even cruise cabins. Be a perfect storage solution for small spaces. Super Durable - Plated with Nickel protective coatings, our hooks feature corrosion resistance and rust prevention. Stainless steel carabiner provides super durability than those with aluminum, which ensures a longer time use. Space Saving- Compact size, light weight and extremely strong hanging capacity so you can quickly and easily organize your home or office and make them more spacious and tidy. Super strong and the attraction depends on the material of the board you attach to.Vertical pull attraction of 80lb, reduced by 2/3 if used vertically. Use our magnetic wall hooks in your home, kitchen, workplace, office, garage, shed, gym lockers or even on the side of your refrigerator to hold your item. Awesome Holding Power: So powerful of a magnet you would think it was bolted to the cabinet..Vertical pull attraction of 80lb, reduced by 2/3 if used vertically. Solved Your Problem Instantly Use our magnetic wall hooks in your home, kitchen, workplace, office, garage, shed, gym lockers or even on the side of your refrigerator to hold your item. Lifetime Guarantee:At any time during your purchase if you feel unsatisfied just return it to us.We will refund full payment promptly with a smile.Because our only principle 100% Customer Satisfaction,satisfied 99% is not good enough for us. 3M METAL RUBBER With 3M metal piece, magnetic hook can be used on most horizontal surfaces. 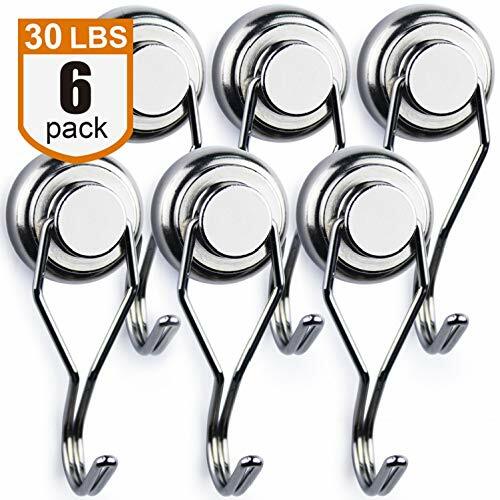 Brand: Master Magnetics | Manufacturer: Master Magnetics, Inc.
40 POUND RARE EARTH NEODYMIUM MAGNETIC HOOKS WORK GREAT ON ALL MAGNETIC SURFACES. 1. HAVE A VERY STRONG MAGNETIC FORCE. On magnetic vertical surface, the hooks pull strength is 40lbs! On magnetic horizontal surface, the hooks force is about 15lbs! 2. NO TOOLS REQUIRED. QUICK AND EASY TO USE. Just put the magnetic hooks on any magnetic surface then you can begin to use. Use them in your bathroom, kitchen, workplace, office, garage or cruise. Perfect for organizing, decorating and storage. items (like keys, gloves or umbrella). Only on the vertical surface, the hooks pull strength is about 40lbs. 2.Surface smoothness and steel thickness also have an impact on hooks pull strength. L-Fine magnetic hooks provide 12 months warranty. High quality: The magnetic hooks are made of high grade of Neodymium (N38). It is the strongest magnetic material in the world and not easy to be destroyed. 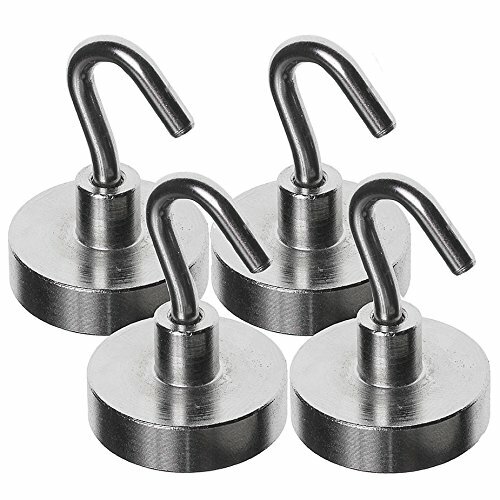 Strong magnets: L-Fine magnetic hooks are able to bear the weight of 40 pounds on horizontal application like ceiling. 15 pounds can be supported if used on vertical surface like refrigerator. Multiple use: Can be used in anywhere like kitchen, bathroom, garage, utility room, office or as a travel accessory. Recommend these for indoor or outdoor use! Easy to install: Just put the magnetic hooks on any magnetic surface, it would hold the staff well. No need to drill, no hole leaves! Save your space: These magnetic hooks are fairly small and don't take up too much space. They can hold many items like grill tools and make your place more organized.